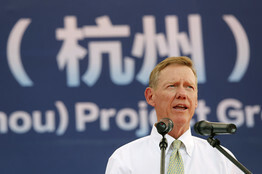 Ford's Alan Mulally, shown in Beijing last August, is spending more time in China amid big new investments. SHANGHAI—Just a few years ago, Alan Mulally, Ford Motor Co.'s chief executive, spent about 10% of his time on matters related to China. These days, the world's largest auto market consumes about one-third of his and his top lieutenants' schedules, each week. The increased focus is key for Ford's future because the company has a lot of ground to make up here. A latecomer to China, the Dearborn, Mich., auto maker has about 3% of the Chinese market. Volkswagen AG puts its share at 18.2% and General Motors Co. calculates its 2012 share at 14.6%. Moreover, Ford is spending big to catch up. The company has committed to spending $5 billion to build five plants in China to go along with the four it has now, and will need to increase its market share to be able to use all the plants' output. The auto maker also is aiming to double the number of dealerships to about 800 by 2015, bring 15 new vehicles to China and launch the Lincoln brand here in 2014. "Clearly this is going to continue to be the highest rate growth for us, both in revenue and profits, over the next few years," Mr. Mulally said in an interview on the eve of this month's Shanghai auto show. "The entire team is spending more and more time in Asia-Pacific." On Monday, Ford Asia chief David Schoch predicted the company's market share here might reach 6% of sales after Ford completes a model build-out in 2015. Many foreign companies in autos and other industries are now getting a sense of the subtleties and complexity of operating in modern China. In recent weeks, even long-established foreign companies with legions of Chinese fans have run into unexpected difficulties. Apple Inc. made a public apology recently after state-run media published reports about customer-service flaws. Volkswagen was pressured into an expensive transmission recall after another Chinese TV report called into question the quality of its gearboxes. Likewise, Japanese auto makers are still struggling to regain sales after a heated dispute over uninhabited islands in the East China Sea pummeled their sales in China. After years of approving new auto factories, the Chinese government has become concerned about excess production capacity and now tends to be more cautious about approving new plants. The government also is keen to see domestic brands become more competitive with foreign makes, Mr. Mulally said. Ford began producing cars in a Chinese joint venture in 2003, four years after GM and 18 years after Volkswagen. The late arrival caused Ford to miss out on partnerships with the larger car companies in the coastal cities of Shanghai and Beijing, where the bulk of car buyers have been in the past decade. Ford has a joint venture with Chongqing Changan Automobile Co., based in Chongqing, in the country's interior. Ford is hoping to catch a second wave of growth as economic development spreads to second- and third-tier cities, which tend to be less wealthy than Beijing and Shanghai but still have huge populations. In a reflection of its efforts to put China into the center of decision-making, Ford's U.S. management is shifting U.S. meetings to early in the morning or late in the evening in order to better accommodate executives in China, who are 12 hours ahead. "We get up really early, we stay really late," said Mark Fields, Ford's chief operating officer, who recently ran a business meeting from a conference room in Shanghai until past midnight local time. "It gives us the sensitivity that we are a 24-hour business." The company soon will start producing a new 1.5-liter, four-cylinder engine that was developed in part to avoid a Chinese tax of about $300 a year on vehicles with engines larger than 1.5 liters. The new engine will be sold in markets around the world, including the U.S., beginning in September. It will be offered alongside a 1.6-liter motor in some markets. Mr. Mulally has decades of experience and many business and governmental contacts in China as a result of his 37 years at Boeing Co. BA +2.14% and the last six at Ford. Two weeks ago, he was one of 100 delegates at the China Development Forum in Beijing, a gathering that brought together China's new political leaders and CEOs from around the globe. "It was very exciting because we had all of the new Chinese leadership there," Mr. Mulally said. Deciding to push forward with the $5 billion expansion was "one of the most important decisions we made six years ago. The minute we made the decision, we were very focused on it, especially me." He also makes visits to the Chongqing mayor's International Economic Advisory Council. "At the most fundamental level, being involved is really, really important," Mr. Mulally said. "We feel very, very comfortable with our position there." In the first quarter of this year, Ford's sales in China rose 54% over a year earlier, driven by its Focus compact. It just started selling the Kuga sport-utility vehicle, a clone of the Escape SUV, and the larger Explorer SUV, which is being exported to China this month. Although GM and Volkswagen continue to expand in China, Ford is gaining on its Japanese competitors, which have been hurt by the political backlash stemming from a dispute between China and Japan over islands in the East China Sea. Toyota Motor Corp., Honda Motor Co. and Nissan Motor Co. have suffered declining sales amid the tensions. "You've got this situation where you have a whole bunch of Japanese brand [shoppers] looking for something else," said Bill Russo, founder and president of auto consulting firm Synergistics Ltd. and a former DaimlerChrysler AG executive. "Ford is really hitting its stride at the best possible moment." A version of this article appeared April 16, 2013, on page B7 in the U.S. edition of The Wall Street Journal, with the headline: Ford CEO Revs Up Auto Maker's China Role. Strong economic growth and consumer confidence boosted first-quarter car sales in China as the mainland shook off last year’s weakness to resume strong double-digit growth. Light vehicle sales in the world’s largest vehicle market rose 17 per cent to 4.42m in the first three months of the year. In March alone, sales of cars, sport utility and other passenger vehicles climbed to almost 2m, the China Association of Automobile Manufacturers said on Thursday. 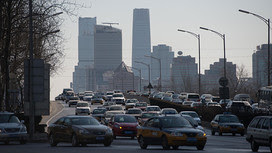 “China’s auto industry delivered solid double-digit growth, driven by continued expansion of its population of urban middle-class buyers,” said Bill Russo of Synergistics auto consultancy in Beijing and the former head of Chrysler in China. But he warned against over-optimistic assumptions about future market growth, which has led to excess capacity in the past, especially among state-owned domestic carmakers. Local independents Geely and BYD recently said they were optimistic about auto demand this year with the new government leadership in place. However, Bernstein Research analyst Max Warburton cautioned in a recent note that despite stronger than expected first-quarter sales in China, future yearly growth was not likely to exceed 6-7 per cent. “Capacity additions still look set to outstrip demand,” he said, adding that he expected the industry to add at least 3.8m units of capacity by the end of the decade. European and American car brands continued to take market share from Japanese rivals in China in the first quarter, auto analysts said, as the continuing political impact of a dispute over a set of islands left Japan’s carmakers struggling to recover ground. Luxury car sales in China continued to moderate from previous high double-digit levels, partly affected by the government’s austerity programme, which may have caused some buyers to delay ostentatious consumption. But medium-term growth in the luxury sector is expected to remain strong as few retail analysts are predicting permanent impact from the austerity campaign. “Compared to the US, Chinese [luxury car sales] will continue to grow at a stable and sustainable rate whereas the US and Japan are simply recovering from lost volume. China’s luxury market will likely double in size over the next five years,” Mr Russo said.